For the 53rd year Delta Tau Delta Fraternity recognized its top 10 chapters with the Hugh Shields Award during the Fraternity’s division conferences in February 2018. 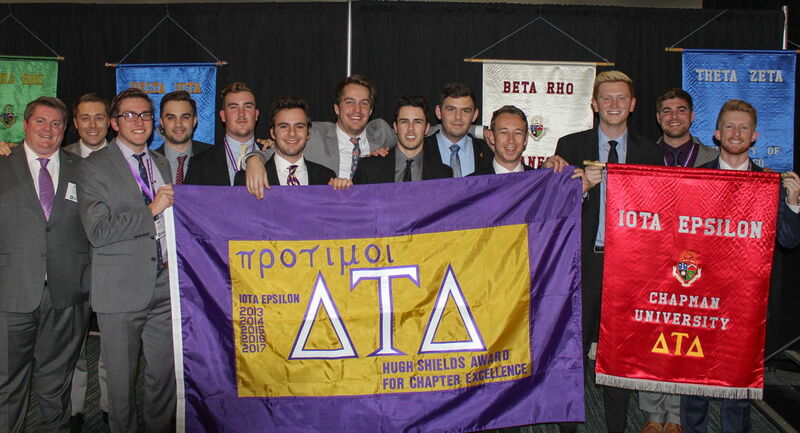 Iota Epsilon Chapter at Chapman University earned a record-breaking tenth consecutive Hugh Shields Award, passing the record they shared with Beta Lambda Chapter at Lehigh University (nine consecutive awards from 1986 through 1984). The Hugh Shields Award for Chapter Excellence was established in 1965. It is named for the late Hugh Shields (Indiana University, 1926), the first executive vice president of the Fraternity. The award recognizes overall excellence in a chapter and is presented to the top 10 chapters in the Fraternity. In addition, 20 chapters received a Court of Honor Award. The Court of Honor Award was officially established in 1965. The annual award is presented to the top 20 chapters in the Fraternity. For the 2017 reporting year, all chapters were asked to submit the Fraternity Awards/Accreditation Report. Chapters were asked to provide documents that measure compliance with the Fraternity’s minimum operating standards, exceptional facets of their operations and Delta Tau Delta programming. Chapters were graded on excellence in chapter finance, recruitment, membership education, academics, alumni relations and community service. Founded in 1858 at Bethany College, in Bethany, W.Va., Delta Tau Delta has 133 chapters and colonies in 39 states and the District of Columbia with a membership of more than 9,000 undergraduates and 120,000 living alumni. The Fraternity posts a GPA of 3.1, making it one of the highest achieving men’s fraternities academically. Delta Tau Delta’s Mission, “Committed to Lives of Excellence,” is what the Fraternity seeks to represent at its host institutions. Delta Tau Delta strives to develop its members’ leadership skills, seeks superior academic achievement, promotes community service efforts and helps its members launch successful careers.